Flavor Bans in California, Multiple Areas! 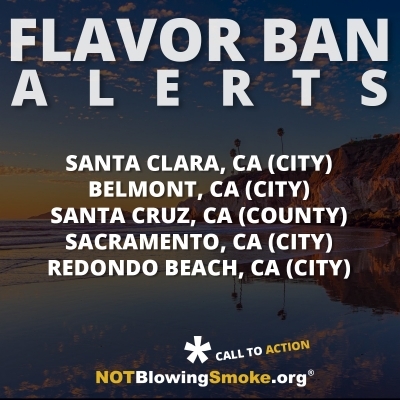 Those of you who follow our regular updates on the flavor ban policies being introduced across the State of California will likely have noticed things are getting rather busy. Instead of putting out a CTA specific to the following areas we've decided to combine them into a single post. 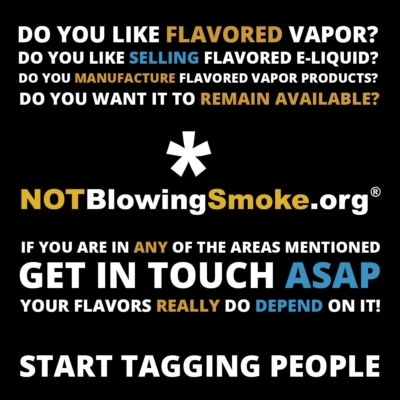 If you are a vaper, vapor retailer, or manufacturer in any of the below-listed areas we will want to hear from you ASAP so we can start rallying and organizing opposition to preserve the availability of flavored vapor products. You can help support the work we do at Not Blowing Smoke by donating directly through Pay Pal by clicking on the button above. You can also get Not Blowing Smoke apparel with thought provoking messages that will help encourage the conversation in the wider public. Join our rapidly growing Facebook group to get up to the minute information and news and to discuss important issues with over 10,000 others. Also check out and like our Facebook page. Copyright © 2015-2018 NOT Blowing Smoke. All Rights Reserved.